Bojack Horseman season 3 is a punch to the gut in all the best ways fans of the series could have hoped for. 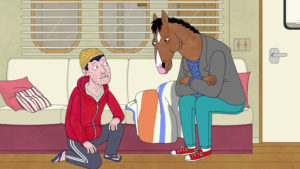 It’s amazing that after three seasons a cartoon about a talking horse humanoid can still offer the best commentary on mental health issues and existentialism on television and this new season is no different. But season 3 isn’t a mere continuing of Bojack’s already gut-wrenching history with making bad decisions; it expands on his and many other of the show’s great characters’ deepest fears and existential thoughts. Picking up where season 2 left off, Bojack is on the Oscar hunt for his role in Secretariat, which directly coincides with his continuing quest to find meaning in his life. After the disastrous events of the finale of season 2, Bojack is quickly finding out, again, it’s not so simple to find one’s self in the chaos of life, especially if you have lived one like his. The season continues the many themes of mental health and despite the many laughs you almost forget that it’s a comedic show. What the series does best in it’s portrayal of the angst of its characters is how real it is, despite of course the bizarre human and animal cross section of characters. It’s unapologetic in its narrative and rarely takes the easy route with its characters as more often than not they make bad choices and suffer all the consequences that come with them. These are not necessarily all good people in the story but they are real people. Bojack, expertly and hilariously voiced once again by Will Arnett, continues to be one of the great anti-heroes of television. This season we once again explore the costliness of his continued penchant for making ruining himself and others, delving a little more deeply this time into his substance abuse problems. As we get closer to the eve of the second anniversary of Robin Williams untimely death, it’s hard not to draw the comparison between the two, as the late comedian also struggled with depression and substance abuse. Shows with characters like Bojack help us to better understand how someone like Robin may have felt at the time of his suicide and how mental health is not something that can be, at least clearly, seen or quantified. But Bojack isn’t the only character with major arcs in their existential crises this season as the show continues to develop Princess Carolyn (Amy Sedaris) into a character of equal weight in many ways to the title character. With Princess Carolyn the show helps viewers understand the toll of ambition and explore what the soul really needs in life. As the season progresses we see how that coincides with Bojack’s own struggle and why, despite how poorly Bojack treats her, they still stay connected in one way or another. Aaron Paul and Will Arnett bring stellar performances to a truly unique show. The season even explores a fairly touchy issues in women’s rights with the character Diane (Allison Brie) and a surprisingly fresh nod to a lesser known mental health issue with the lovable, buffoon character Todd played exquisitely once again by Aaron Paul. The new season is about heavy as it’s always been, if not more so, but it takes time to be light-hearted of course, injecting plenty of the episodes with absurdist humor and animal puns galore but the season’s fourth episode is an absolute delight. Easily one of the series’ best to date, episode 4 takes Bojack quite literally out of his element and the result is a joy to watch. It’s one of the most beautifully and hilariously animated episodes in modern animation today that pays obvious homage to another quality existential comedy, Lost in Translation, and even Charlie Chaplin. Season 3 is everything fans of the series could have hoped for and more in the best way. It’s appropriately dark as we all expected, delving deeply once again into the mental health themes of the previous two seasons but not without moments of levity and plenty of absurdist humor to boot. If you’re a fan of the show you don’t need convincing to watch this new season, but if you’re new to Bojack Horseman it’s quality, binge-worthy television that delves deeply into real human issues. In a world where we are constantly being told by less intelligent people to “stop being so sensitive,” it’s great that a series takes the time to explore our fears, melancholy and self-doubt and tell us that it’s okay to feel them. We are not animals after all.